Automated Dimensioning – The Key to Efficient Warehouse Management? Inaccurate measurements and transposition errors are common pitfalls when trying to measure incoming and outgoing freight by hand. And both open your Transportation Management Systems (TMS) and Warehouse Management Systems (WMS) up to bad data, which can limit their effectiveness and compromise the efficiency of your warehouse or distribution center. In a manual receiving operation, employees measure and weigh incoming packages and palletized freight by hand before manually keying the data into WMS software where it can be used to recommend the best storage location for incoming goods. When measurements are off, or incoming freight volume is high, the whole process can get bogged down and out of sorts. With parcel and pallet dimensioners installed near receiving areas, the whole inbound process can be automated. Parcel dimensioners can be installed along conveyor lines, or over parcel scales at existing workstations. Packages need only stop for a few seconds, allowing the dimensioner to measure, weigh and transmit package information directly into the client’s WMS system. Pallet dimensioners work in much the same way. A forklift operator drops incoming pallets under the dimensioner where they’re quickly measured and weighed (weight can be transmitted from a floor or forklift scale’s indicator). Again, all that information is sent to the company’s warehouse management system where it will help with item placement. 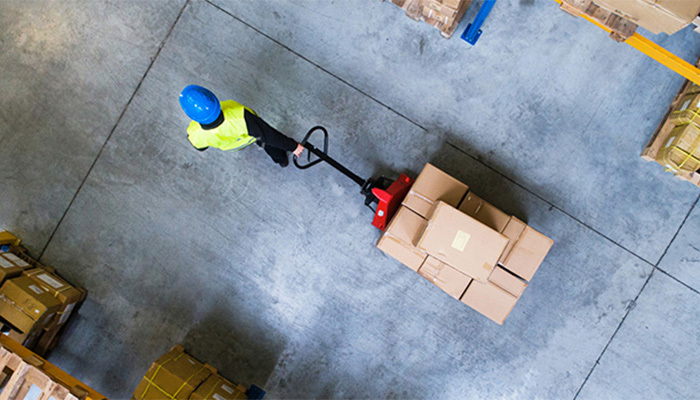 Carton optimization software, which is built into many modern warehouse management systems, is crucial to lowering shipping costs and cutting down on packaging waste – two major concerns for most enterprises. Automated dimensioners, whether installed near receiving doors, or at designated staging areas throughout the warehouse, provide the accurate measurements these systems need to operate at peak efficiency and save your business money. Load planning software helps shippers and carriers determine how the available loading space inside containers and trailers can be optimally used to transport freight. Factors such as trailer dimensions, maximum axle load, weight capacity, freight dimensions, and freight weight are all considered when making calculations. Consequently, providing load planning software with accurate DIM-weight information is paramount. Incorrect measurements or weight can throw calculations off, resulting in loading delays and/or unbalanced, potentially unsafe, load-outs, which are all bad for a business’ bottom line. Is Freight Dimensioning Right for You? In these ways and others, automated parcel and pallet dimensioners are helping warehouses and distribution centers become more efficient. To see if automated dimensioning can benefit your business, explore some of the available solutions, and don’t be afraid to reach out with questions specific to your operation.